Not sure what prompted this latest mass mailing, but this weekend, the Salt Lake valley woke up today to a book on their doorsteps and/or in their mailboxes. A free book? Don’t get too excited. It’s a religious book, and one that’s been around since 1858. 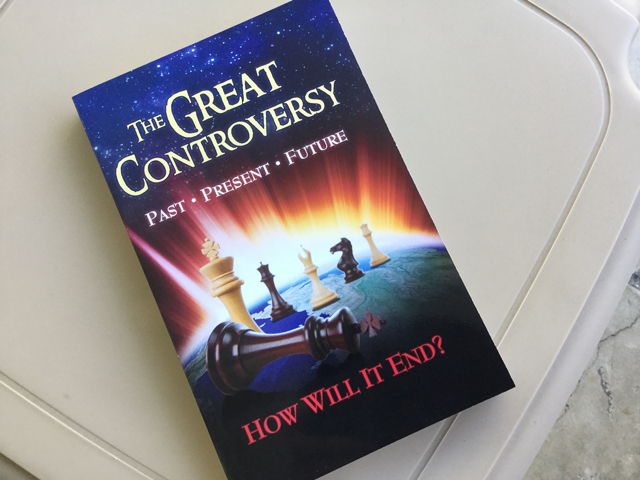 Originally written by Ellen White, who is the founder of the Seventh-day Adventist church, it’s a story of fear and preparing for the end of the world. 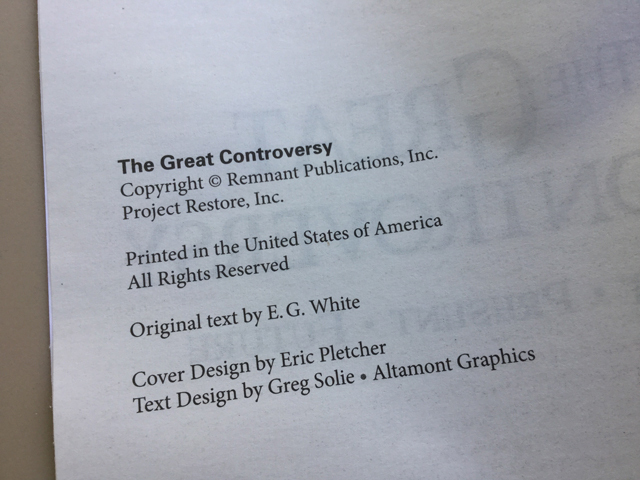 Great Controversy? Why yes this book is. This book contains many chapters about how to prepare for the end of world. It has pretty much nothing to do with Jesus or spirituality. 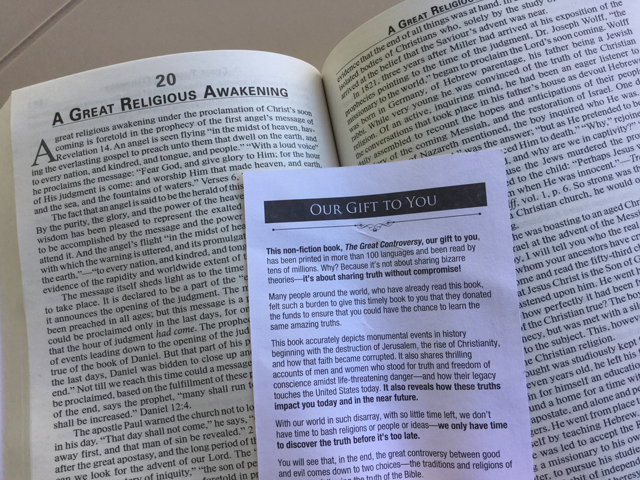 It’s wrapped around missionary efforts from an organized religion who’s goal is to convert people to their church, in this case, Seventh-day Adventist. The general idea of the Seventh-day Adventist religion is that they treat the sabbath on a Saturday, not Sunday like most modern Christian religions. I’ve never read this book, but had heard of it before. Just forgot the title of the book and it’s dire messages through the 318 pages. I’m not religious even though I belonged to an organized religion for years [Mormom] so anytime I see this waste of trees and printing, it irritates me on many levels. Not only could many trees been saved from this type of religious propaganda, but also the money used to print this many books on a regular basis could go to so much more positive things like feeding the hungry and caring for the poor… things Jesus supported. Not some organized religion that controls people and places fear into the hearts of unsuspecting people. In the last 5 years, this book has been printed and managed by Remnant Publications. If you buy enough copies, the cost is around 60 cents per book. Still, a waste of money and trees. If you found this book on your doorstep or in your mailbox, the best option at this point is to place it into your recycle bin. If you have read it before, please feel free to comment below and tell me if I’m correct or if I’m totally off base in my assessments. I have zero interest in ever reading it, although I did skim through it years before and a bit today. Nothing of value, at least for this non-believer. We don’t get books left at the doorstep but we do get some ‘friends’ knocking on our door wanting to leave us literature. I respect everyone’s faith so I’m friendly enough to them but ultimately the literature ends up in the trash. Is a bit of a waste all round really. You need to make that part of your Goodreads reading goal. Then send it to me.